My love of fishing began very early, when I was only five or six. At my parents cottage I loved to use a bobber and worm to catch bass off the dock. The one day as I reeled in a small rock bass, a long shape lunged out from under our dock and ripped the fish off my hook. The killer hung suspended for a moment, staring at me, with the rock bass sideways in its jaws. Then, as I stood there, mesmerized, it casually swam off into the depths to devour what it had stolen from me. From that moment on I was addicted to catching pike! Every chance I got to fish, I wanted to land big pike. I used huge Rapalas, heavy Daredevle spoons, and big surface baits trying to lure those big, toothy leviathans into striking. When I became a fly fisher, the addiction carried over. 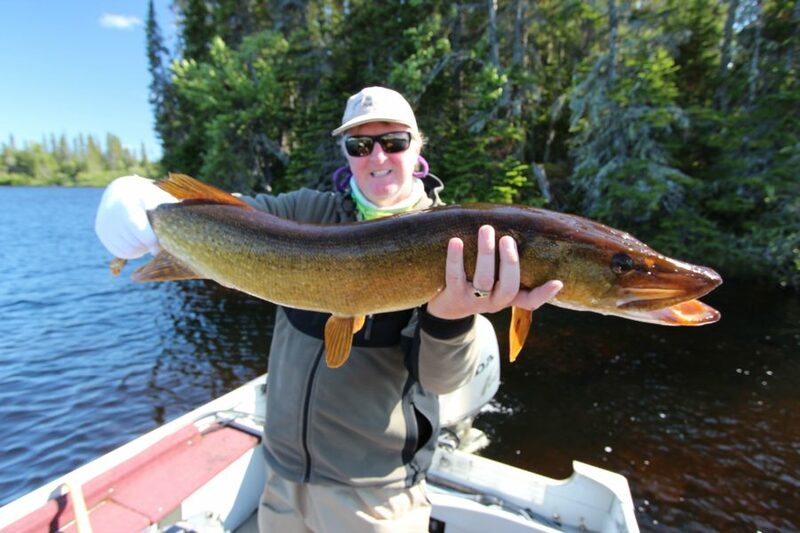 I fly fished for pike throughout Canada and the USA whenever I could. Sometimes my friends would make fun of me as I went off in search of pike while they cast dry flies for brook trout, but I didn’t care. My admiration and addiction for the water wolf remained unshakeable, even today. Nearly twenty years of hunting pike with a fly, has taught me a great deal. I have also learned much from guides, authors and other pike addicts. Here are some of the more important things I have learned which make my pike fishing successful. In spring, post-spawn pike can be tough to catch. The water is still very cold and the fish are exhausted from mating. This is a time of year when you often need to slow down your presentation, use smaller fly patterns, and concentrate on casting to fish you can spot. At this time of the year, pike are still often in the shallows, water less than six feet deep—even as shallow as a foot. The patterns I prefer are size 1/0 to size 4 Deceivers, Bunny Leeches and Zoo Cougars. My favourite colors include white, black, and chartreuse. Deceivers in variations of blue and white have been particularly effective for me. Summer is when the bigger fish go deeper, hanging near drop-offs and deeper weed edges. This is when I use a full-sink line with a type 4 or 5 sink rate (4-5 inches per second) coupled with a short leader of 3-4 feet. Getting your fly down into the pike’s strike zone is critical. This is the time of year to use big flies, such as saltwater patterns. Graham Coombes’ Swimtrue patterns are deadly, as are Steve Silverio’s Predator patterns. My favourite times of the day for bigger pike are when the light is low. In the early morning, when the sun is setting and has just kissed the top of the trees, the long shadows seem to provide pike with enough security to begin actively hunting. Similarly, at dark, I love casting these big flies near weed edges on sunken islands, twitching them in, looking for that deadly shadow following them. Fall is often the best time to catch some of the biggest and heaviest pike of the year. After a full season of eating they are heavy brutes with lots of energy, but they are still eager to feed, needing to put on us much weight as possible to help them survive the winter. At this time of year, I generally concentrate on water around 10 to15 feet deep, using a full sink line and a short leader. I also convert back to smaller fly patterns and fish them slowly. As the pike are not as apt to chase fast moving flies as they are in the summer, the smaller fly and slower retrieve are more likely to trigger a strike. There is a simple formula I use when choosing patterns for pike: a combination of size, silhouette, color, and action. I take into account what is most likely the most common prey for pike at a particular time of year, whether it be small walleye, perch or suckers, and try select patterns that resemble those food sources in size, silhouette, color and most importantly, action. If a fly looks like a perch, is in the depth of water where pike expect to find perch, and if the patterns behaves like a fleeing perch, then you’re almost guaranteed to hit paydirt. Catching big pike on surface flies is one of my most favourite things to do. The takes are aggressive and merciless. I prefer big, but light, patterns to use on top, principally big foam poppers similar to those used for tarpon in Florida, as well as a deadly deer hair pattern, the Black Slider. These are all easy to cast, offer big profiles, and are absolutely irresistible to pike on the hunt. You can have the right fly pattern, the right equipment and be in the right spot to catch big pike, but you will not be successful unless you present the fly in a natural way that triggers a strike. It is imperative that you work the fly with a strike-inducing action. My favourite presentation is jerk-strip retrieve. Whether it is a 2/0 Deceiver or Black Bunny, this jerk-pull retrieve works just as well for big trout as it does for big pike. These Alpha predators find it too irresistible and attack patterns presented this way. The key is that this retrieve makes the fly act as if it’s trying to get away, but can’t. It pauses or swoons like an injured baitfish. Usually, it will be on the pause that you’ll get the strikes..
Another key point about sub-surface presentation is getting the fly down to the right depth in the water column. For far too long I used a floating line or an intermediate line to get my fly into the kill zone. While such lines are fine for fishing when pike are in the shallows, when they’re in water six feet deep or more, it is critical to use a full sinking line with a fast sink rates. I prefer density compensated lines that have sink rates of between 4-5 IPS (inches per second). However, don’t use these lines with long leaders. I usually have only three to four feet between the flyline and fly. You can use an intermediate line successfully in the latter part of the summer when you want to rip big flies over the top of weedbeds lying one to two feet beneath the surface. Pulling big flies such as the Predator over the tops of the weeds can produce heart-stopping action: the strikes are lightning fast and very, very violent! Sinktips are not my preferred way of getting flies down, as they tend to belly and cause problems with presentation. But they can be used with some success on dropoffs and ledges. This is absolutely best way to catch aggressive pike, because it is so visual. As natural hunters, big pike are used to attacking small ducklings, muskrats, frogs, snakes and other hapless creatures which accidentally blunder into their kill zone. I like to use light but bulky flies and cast them around likely ambush spots, such as weed edges, rocky points, sunken timber, drop-offs and of course lily pad patches—all are good bets when hunting pike on top. 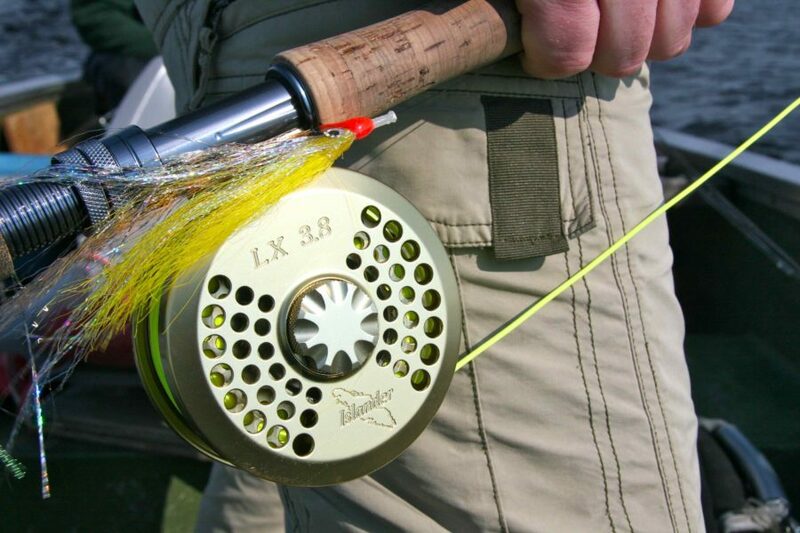 I have encountered many anglers using very complicated tapered leaders to fly fish for pike. These are totally unnecessary. My usual rig is quite simple: four to six feet of 30 or 40lb mono tied loop-to-loop to an 18 inch piece of wire leader. Modern wire leaders are impressively strong, durable and easy to tie with. My favourites are RIO Powerflex Wire Bite tippet and Tyger Leader. I have never had one of these tippets fail with toothy pike. When using a sinking line, I shorten this rig to two or three feet of mono tied to a length (12 inches maximum) of wire tippet. Often big pike, like muskies, will follow your fly to the side of the boat. You can try to do the figure eight technique, but this is difficult with a long, flexible fly rod. The tip will just bend too much. Instead, I have been using the oval routine which was taught to me by Don Pursch at Neilsens Fly-In Lodge at Rowan Lake in Northern Ontario. 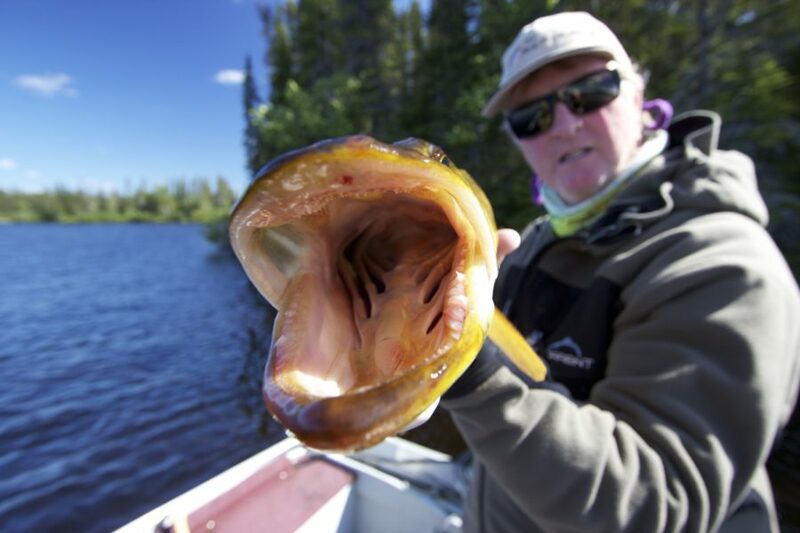 There are huge musky in this lake, which often follow to the boat, and the guides developed this fly rod technique to induce the fish to strike. It involves bending down to extend your reach and making the fly swim in an oval pattern as if it were on a race track, inducing the fish to follow and, in most cases, strike. The embedded video demonstrates details of the technique visually. I know as soon as some of you read this title you rolled your eyes. However, treble hooks have a significant place in pike fishing . Often big pike use their crushing jaws so effectively, that when one chomps down on your Deceiver or similar single hook streamer pattern, the sheer pressure will flatten the fly, causing it to lie on its side in the fish’s mouth. 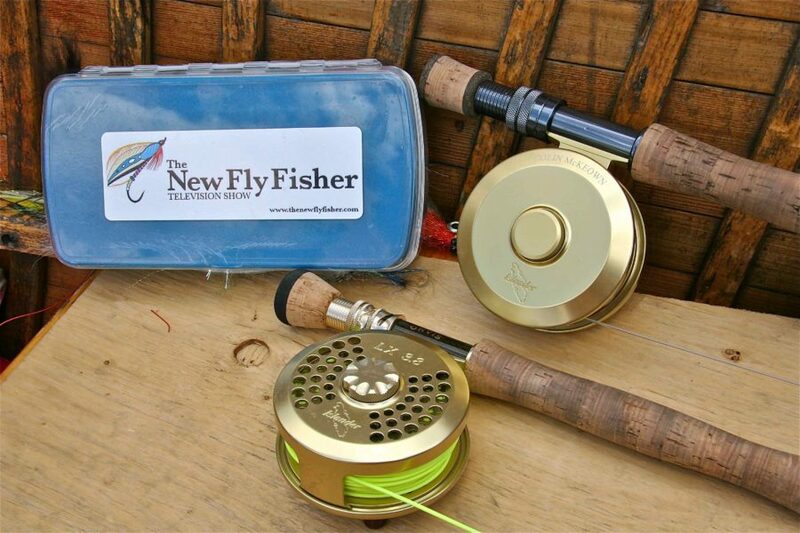 Consequently, the fly will simply slide out on the hook set without hooking up. I have lost numerous big pike this way. However, if you slide a small treble hook onto your single hook and put on a piece of rubber tubing to hold it in place, then the pike will always be hooked—on the treble. Of course, you should pinch all the barbs down in order to ensure minimum harm to the fish and make it easy to release it. It has been my experience that the treble usually catches the pike in the corner of its mouth. It’s a very effective way of avoiding those missed hook sets which occur when using just a single hook. I love big pike because they are so aggressive, and fearless—the consummate predators of freshwater. Catching them on a fly rod makes the experience even better. 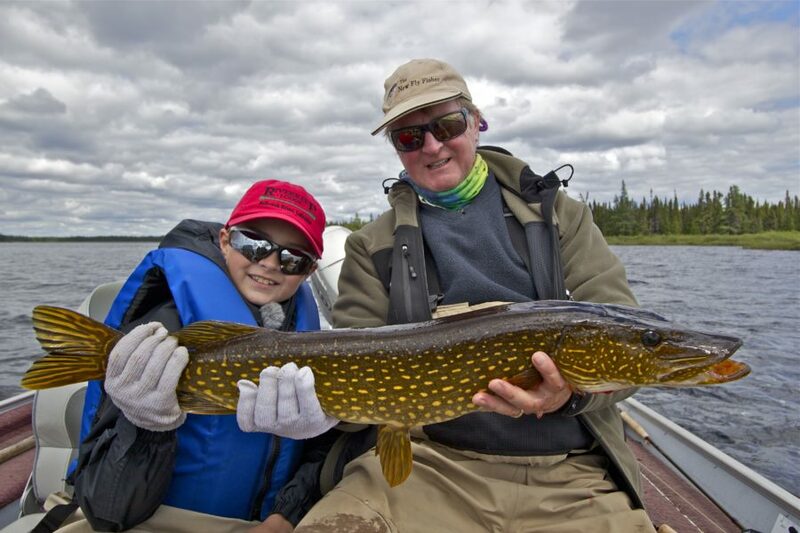 Over the years, I have introduced a number of anglers to fly fishing for pike. Once they tried it, they were totally hooked! If you have not tried pike on a fly, I strongly encourage it. These tips I have garnered from years of fishing should help you more and bigger specimens.